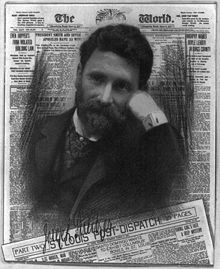 Joseph "Joe" Pulitzer (April 10, 1847 – October 29, 1911) was an American publisher of Jewish descent. Most people link the word Pulitzer to the Pulitzer Prizes. These prizes were established by his will, after his death. He is also known (along with William Randolph Hearst) for starting yellow journalism as a way to sell more papers by printing sensationalism in the articles. Joseph Pulitzer was born in Makó, in present-day Hungary. Originally, he wanted to do a military career, but was turned down by the Austrian army. They said his health was bad and that he did not see very well. He went to live in the United States in 1864 to serve the Union in the American Civil War. After the war he settled in St. Louis, Missouri. In 1868 he began working there for a German-language daily newspaper, the Westliche Post. He joined the Republican Party and was elected to the Missouri State Assembly in 1869. In 1872, Pulitzer bought the Post for $3,000. Then, in 1878, he bought the St. Louis Dispatch for $2,700 and merged the two papers, which became the St. Louis Post-Dispatch, which remains St. Louis' daily newspaper. It was at the Post-Dispatch that Pulitzer developed his role as a champion of the common man with exposés and a hard-hitting populist approach. By 1883, Pulitzer had made a lot of money. In that year, he bought the New York World. That newspaper had been losing $40,000 a year. He paid $346,000 to Jay Gould, the owner. Pulitzer changed its focus to human-interest stories, scandal, and sensationalism. In 1885, he was elected to the U.S. House of Representatives, but resigned after a few months' service. He did not like politics. In 1887, he recruited the famous investigative journalist Nellie Bly. In 1895 the World introduced the popular Yellow Kid comic by Richard F. Outcault. This was the first newspaper comic printed with color. Under Pulitzer's leadership, circulation grew from 15,000 to 600,000, making The New York World the largest newspaper in the nation. The editor of the rival New York Sun attacked Pulitzer in print. He called him "The Jew who gave up his religion". This was in 1890. This was intended to turn away Pulitzer's Jewish readership. Pulitzer's already failing health deteriorated rapidly, and he left the newsroom. He continued to actively manage the paper from his vacation retreat in Bar Harbor, Maine and his New York mansion. In 1895, William Randolph Hearst purchased the rival New York Journal, which led to a circulation war. This competition with Hearst, particularly the coverage before and during the Spanish-American War, linked Pulitzer's name with yellow journalism. After the World exposed a fraudulent payment of $40 million by the United States to the French Panama Canal Company in 1909, Pulitzer was indicted for libeling Theodore Roosevelt and J. P. Morgan. The courts dismissed the indictments, in a victory for freedom of the press. In 1892, Pulitzer offered Columbia University's president, Seth Low, money to set up the world's first school of journalism. The university initially turned down the money, evidently unimpressed by Pulitzer's unscrupulous character. In 1902, Columbia's new president Nicholas Murray Butler was more receptive to the plan for a school and prizes, but it would not be until after Pulitzer's death that this dream would be fulfilled. Pulitzer left the university $2 million in his will, which led to the creation in 1912 of the Columbia University Graduate School of Journalism, but by then the first school of journalism had been created at the University of Missouri. Columbia's Graduate School of Journalism remains one of the most prestigious in the world. Joseph Pulitzer died aboard his yacht in the harbor of Charleston, South Carolina in 1911. He is interred in the Woodlawn Cemetery in The Bronx, New York. In 1917, the first Pulitzer Prizes were awarded, in accordance with Pulitzer's wishes. In 1989, Pulitzer was inducted into the St. Louis Walk of Fame. This page was last changed on 13 April 2019, at 04:24.